While there is a focus on both lightsaber arts and Force techniques, within the Order, Kieran also pursued his interest in engineering and piloting alongside his training as a Jedi, making him invaluable to the Alzoc III branch for his unique talents. He was frequently tasked to tend to the vehicles stored in the enclave’s hangar, specifically the Starfighters and vessels required for FTL. His extensive study of engineering saw Kieran elevated to the Circle of Artisians, becoming a notable member. This also lead to Kieran acquiring full responsibility for the vehicle maintenance and the acquisition of the Alzoc branch’s engineering needs. Holding a Military class PL1 licenses, Kieran’s not only a more than capable pilot but he’s also an official instructor, tasked with the responsibility to test and distribute official licences to other would-be pilots looking to advance themselves into military fields. Kieran Orion’s well known for rejecting the old ways, more street thug than he is a philosopher. His entry and training within the Jedi Order has been anything if not a controversial case study of unconventional method and a look into an alternative approach on how to do right by those that struggle to live in peace. First impressions, aimed at Kieran, lead to an abundance of questions, that challenged the expectations of the Jedi Order, as his approach to training vastly contrasted with the rest of his peers. His casual persona and personal approach, allowed greater ease when working alongside everyday civilians. Kieran’s capacity for sentimentality and emotion was his strength, acting as his personal motivation to serve the Order. The clear differences in mentality revealed an obvious distinction between the Order and the Iridonians. However, there were traits that were viewed favorably, by both the Zabraks and Jedi, which Kieran possessed. His convictions were widely acknowledged by all, firmly believing in the need for sacrifice and selflessness, something he constantly employed when prioritizing the needs of others before his own well being. Having grown up with a dark and troubled background, of loss and conflict, his sense of duty and intention to provide aid for those he encountered across the galaxy, is an uncontested part of his personality. 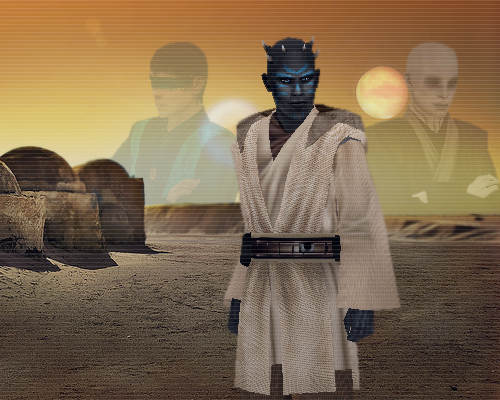 Kieran Orion’s resignation from Alzoc III was accepted and documented within the Jedi Order’s Archives yet few details regarding the reasons behind his departure were mentioned. Kieran was engaging in highly confidential consultations with the Galactic Republic’s Military Fighter Corp, mediated through the Jedi Council. The Republic reached out to the Order, requesting someone of Kieran’s knowledge and experience to enlist in the military forces. The Mission would see Kieran stripped of his current status within the Jedi Order, black-listed and drafted into the Republic Military ranks to undergo a grueling three years of Military life and investigation into substantial allegations of corruption. Although no longer an official member of the Order, Kieran still maintained contact with former High Councilor Sai Akiada and his longtime friend High Councilor Sebastin Creed. Kieran routinely kept these two men up to date on his progress. With the aid of the Council, who supported Kieran from behind the scenes, and a collection of Republic officers and soldiers, Kieran Orion managed to expose several key higher ranking personnel of whom had been actively taking part in illicit acts that sought to move against military protocol in the darkest regard. Through the course of Kieran’s mission, he was registered under an alias, which led to removal of his service from the military archives, leaving his temporary role unacknowledged. After three hard and volatile years of duty, his primary objective had been fulfilled and he would soon return to the one home Kieran could depend upon. The Jedi Order of Alzoc III. 302.20 ABY – Kieran Orion was initiated. 305.12 ABY – Kieran Orion was promoted to Novice. 306.16 ABY – Kieran Orion was taken as Amoné Fayden’s Padawan Learner. 320.02 ABY – Vantus Fayden was killed, Amone Fayden resigns from the Jedi Order. 320.25 ABY – Kieran Orion was granted the title of Jedi Knight. 325.02 ABY – Clara Baunes was promoted to Novice and taken on as Kieran Orion’s Padawan Learner. 325.24 ABY – Kantha Maitri commit suicide. 326.13 ABY – Zander-bo Umra was taken as Kieran Orion’s second Padawan Learner. 327.18 ABY – Kieran Orion departed Alzoc III on assignment to the Republic Fighter Corps. 329.08 ABY – Zander-Bo Umra was taken as Arven Silaan’s Padawan Learner. 329.21 ABY – Clara Baunes transferred from the Alzoc III Enclave. 329.22 ABY – Kieran Orion returned to the Alzoc III Enclave. 331.11 ABY – The Alzoc III branch transfer to Yavin IV. 332.03 ABY – Kieran Orion was granted the title of Ace Commander. 332.04 ABY – Kieran Orion formed the Ace Squadron. 333.05 ABY – Kyrios Vox was taken as Kieran Orion’s Padawan Learner. 337.29 ABY – Rui Vuusen was killed during an attack against Arkania. 338.26 ABY – Jago Mirax was taken as Kieran Orion’s second Padawan Learner. 345.05 ABY – Keiran Orion departs the Rannon Praxeum.